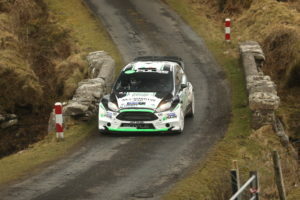 Former double National Rally champion Declan Boyle took a comfortable victory in the opening round of this year’s Triton Showers series by bringing his Ford Fiesta home 37 seconds clear of the nearest opposition in the Achill Island Hotel-Connacht Print and Signs Mayo Stages Rally yesterday. The Donegal driver and his new Monaghan partner James O’Reilly led from the opening stage and were never headed all day, with Josh Moffett and Keith Moriarty taking runner up position ahead of Desi Henry and Liam Moynihan in yet another Fiesta, just over a minute farther back. Two more ex-title holders were out of luck, with Donagh Kelly recovering to tenth place at the end after a disastrous puncture, while Roy White slid off the road on the first stage and was completely out of contention by the time he could restart. Adrian Wray won the Group N Production class, with Jason Black and Jack McKenna the Junior winners. Guy Foster scored a convincing win in TDC’s Clubman Autotest at Mondello Park, setting best times on nine of the ten tests, beating Darren Quille by six seconds, with Cork’s Liam Cashman the best saloon driver in third place overall.